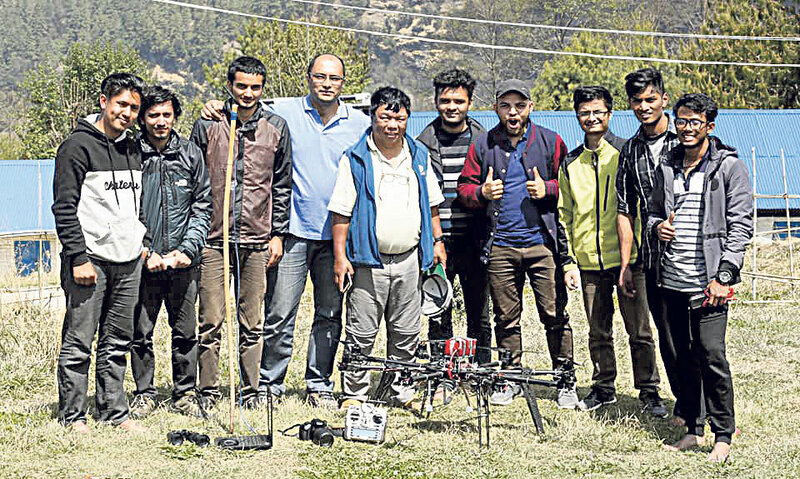 Mahabir Pun (center) with the team of engineers that built the medical drone. MYAGDI, April 13: Until a few years ago, Thas Bahadur Garbuja of Ramche, Annapurna Rural Municipality-8, often had to return home empty-handed from the local health post due to the lack of medicines. He says it was hard even to get the most demanded and commonly used drug paracetamol. As a result, the locals were forced to take a long walk to the district headquarters Beni even for common medicines and health services. It's not like the health workers didn't want to serve the villagers but the medicines were not supplied on time. However, the locals won't have to go through that ordeal from now onwards. On Sunday, a 'medical drone' reached Ramche carrying 1 kg of medicines from Himanchal Secondary School (HSS), Nangi. This has elated the locals here. "We had never expected that we will ever receive medicines from an aerial vehicle. We all welcomed the drone," said Garbuja who is also the chairperson of a local development committee. According to him, the drone reached the village by flying an altitude of 1500 meters and a distance of 1 and a half kilometers from Nangi. With this, the locals are expecting that they will no longer have to suffer from illnesses due to the lack of medicines. 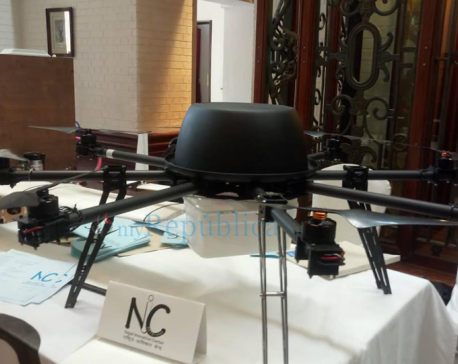 This medical drone is the first gift of National Invention Center (NIC), led by social activist Mahavir Pun. It had also been put up for a test flight on Saturday. After a successful test flight, the drone was sent to Ramche along with medicines the next day. This drone will be used for medical supplies and for bringing the sample of human fluids to laboratories for tests, informed Pun, the chairperson of center. NIC has invented two types of medical drones - the 'Octocopter' and the fixed-winged drone. "We were successful in delivering the medicines through the Octocopter,” said Pun. This prototype which is new for the country has also grabbed the attention of the International Invention Center. During the test flight, Octocopter had fled a distance of 1500 meters in the high mountainous region. "This has been proved as a milestone in the technical development of Nepal," said one of the members of the team. These drones can be used to deliver medicines in a distance of 2 to 5.5 km. According to Dr Roshan Neupane, chief of the District Public Health Office, Myagdi, the invention will be widely used in the remote and underdeveloped areas of the district which are yet to be linked with roads. "This can be a boon for the patients who otherwise had to lose their lives due to the lack of medicines," said Neupane. As of now, these drones will be used in ward 7 and 8 of Annapurna Rural Municipality. NIC is planning to make drones which can travel up to 20km in the near future.